A Meaningful Online Spiritual Community? Can You Have a Meaningful Online Spiritual Community? Many years ago, when public access to the Internet was in its infancy and dialup was the only means to connect, I pondered the idea of church online. The World Wide Web did not exist then, so I considered if Usenet (online discussion boards), file sharing, and email could cobble together a church experience. I concluded it was possible, but I’d let others pursue it. Three decades later, courtesy of many technological advances, church does occur online: Internet church, e-church, church 2.0, church in the cloud, or whatever label you might want to call it. Church can indeed occur online—and it does. Church is one thing. The more important question is community. Can Christian community occur online? 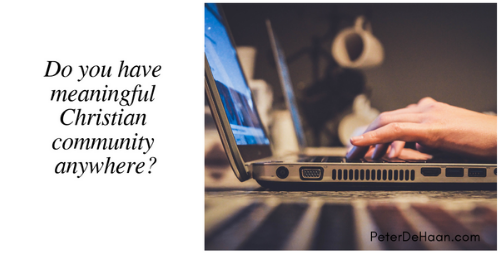 The quick answer is, “Yes, of course!” All manner of communities exist online, including Christian community. Facebook groups, Google+ circles, blogs, and a myriad of other tools can all provide a means to make personal connections and foster community online. This community can be good and may be the only community some people have. Just as an online church can approximate a physical church experience, so to, an online Christian community can approximate the benefits of physical community. But is this enough? To the point, can a meaningful spiritual community occur online? With effort we can get close, very close. However, one element it would lack is physical touch. After all, what if the one thing a person needs more than anything else is an appropriate touch from another human being? How can you hug someone online? But then, when is the last time you hugged someone who was in need at church? Church, whether online or in person, often falls short of what it could be. So, too, community, both online and in person, often falls short, too. We can do better; we need to do better. We deserve it, and Jesus expects it.